£900 is the usual minimum for the full 7-piece line-up. The band is based in the London area and will normally increase the fees for bookings further away. You should expect a higher fee if a booking is taking place on a weekend or a day that normally attracts a premium, eg, New Years Eve, Christmas, etc. Also if your event will last longer than the typical time for a function or is expected to have a finish in the "small hours". However, there is always some degree of flexibility and we are always prepared to negotiate on all aspects of a booking, including price. 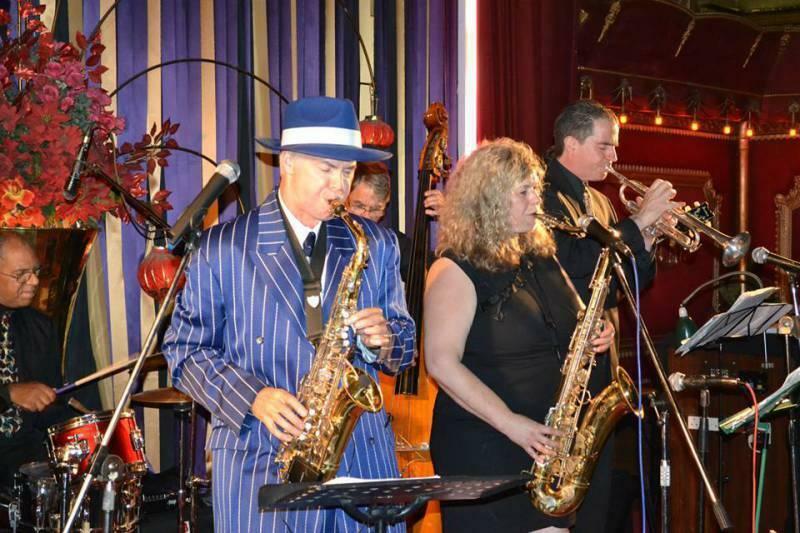 What makes One Jump Ahead stand out from the other Swing and Jive bands around? Firstly, they've been playing for OVER 30 YEARS now and a band doesn't last that long unless they deliver! 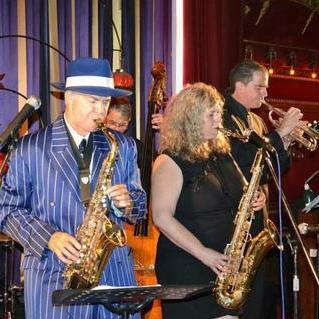 Audiences invariably want to DANCE when they hear the way these cats swing. Their huge repertoire includes the best of the "Great American Songbook", from 1940s & 50s jump/jive rhythm & blues to classic rock’n’roll songs, 1960s soul hits and Rat Pack material. A few carefully selected vintage pop classics, comic novelties and their own critically acclaimed compositions might get thrown into the gumbo too. They have wowed audiences from Islington to Israel, Clerkenwell to County Cork and from Docklands to Deutschland! Thank you to you and the band for doing such a great job at our wedding in July. You guys had such great energy, our guests loved dancing to you. Thanks for playing a good variety of songs too so that our non-swing dancing guests could show off their moves too! We loved the first dance and really appreciate the band learning the song for us, we hope you will continue to play it in your future gigs. We are very experienced and versatile, both in musical terms and practical terms. 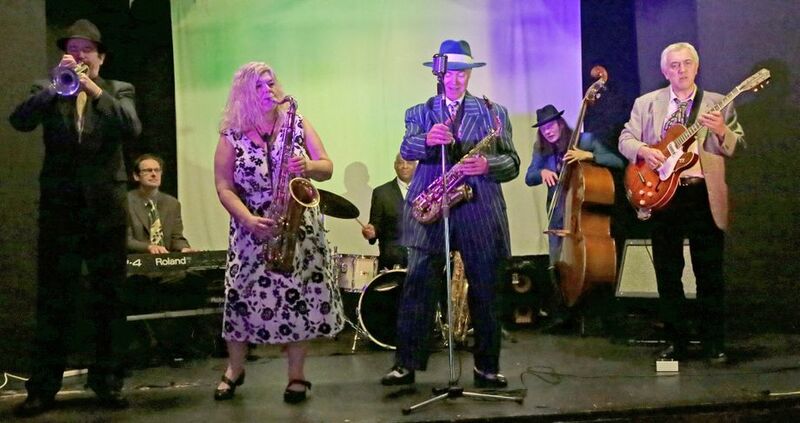 We prefer to perform in our full 7-piece format but we can trim the band to meet smaller budgets, right down to a quartet or even less, although we'd recommend 4 as the minimum if you want people to dance. Our speciality is the swing/jive style of music loved by jive dancers and related styles but we have plenty of rock'n'roll and soul/Motown classics too. The bandleader is a skilled dancer and knows what's likely to get people on their feet. We also have lots of smooth jazz, crooner style material as well as humourous novelty numbers including some alternative versions of well-known standards. Playing for YOU with luck! We played at the London post-premiere party for Aardman Animations film "Chicken Run" and recorded a session for Paul Jones' Rhythm & Blues show on BBC Radio 2. 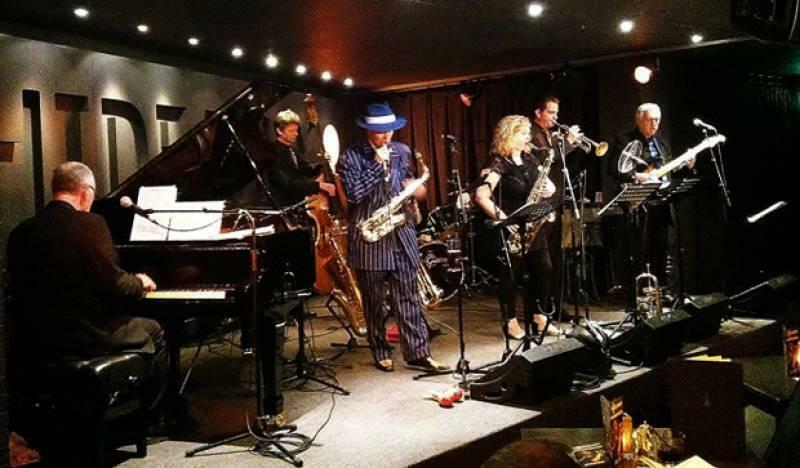 Several stars of the London jazz scene are past members of the band including guitarists Nigel Price and Billy Jenkins, pianists Tim Richards (author of the best-selling "Improvising Blues Piano") and Hilary Cameron, and drummer Kenrick Rowe (just back from a world tour with PJ Harvey). We have our own PA suitable for audiences of up to 250. Enhancement for larger audiences can be arranged. We also have our own lighting but not what you'd call a "light show". We believe that the MUSIC is what's important, not distracting spectacular lighting effects. One less than however many sets we're playing! The number and length of our sets are fully negotiable but are typically 2 x 60 minutes or 3 x 45 minutes. We normally like a minimum of 15 minutes break between sets but tell us what you want and we'll try and oblige if it's not unreasonable. Almost certainly, but give us a few weeks to get it organised, please. Ideally a minimum of 3 metres depth by 6 metres width for the full 7-piece band but we have squeezed into less and can manage with less if the band plays as a smaller unit. Yes we do. Copies forwarded on request. Fully negotiable but "normal" bookings are for 2 x 60 minutes OR 3 x 45 minutes. Cash, cheque or BACS transfer preferred. PayPal might also be possible to arrange. Unfortunately no credit cards at this time. Barbican Centre, Royal Festival Hall, Inner Temple, Waldorf Hotel, Royal Garden Hotel, Great British Rhythm & Blues Festival, Cafe Royal, Berkeley Castle, Eltham Palace, Goodwood House, Hassop Hall, 100 Club, Mean Fiddler, Langham Hilton, Hurlingham Club, Pinewood Film Studios, Carlton Club, Belvoir Castle, ICC Birmingham, Assembly Rooms Bath, Broadgate Club, Guinness Jazz Festival Cork, Great British Beer Festival, Commonwealth Club, University of Kent, Middlesex Polytechnic, Cruise Inn Amsterdam, Royal Beach Hotel Eilat, St Pierre Park Hotel Guernsey, Fulham Palace, Gonville & Caius College Cambridge, Wroxall Abbey, South Hill Park Arts Centre, Watermans Arts Centre, Royal Naval College Greenwich, Great Fosters, Middle Temple, Lansdowne Club and many many more! Dances, festivals, all kinds of parties including wedding receptions, corporate events, anniversaries, etc. We can also play gentle background instrumental jazz, perhaps with just a few of the band, for drinks receptions, during dinner, etc. 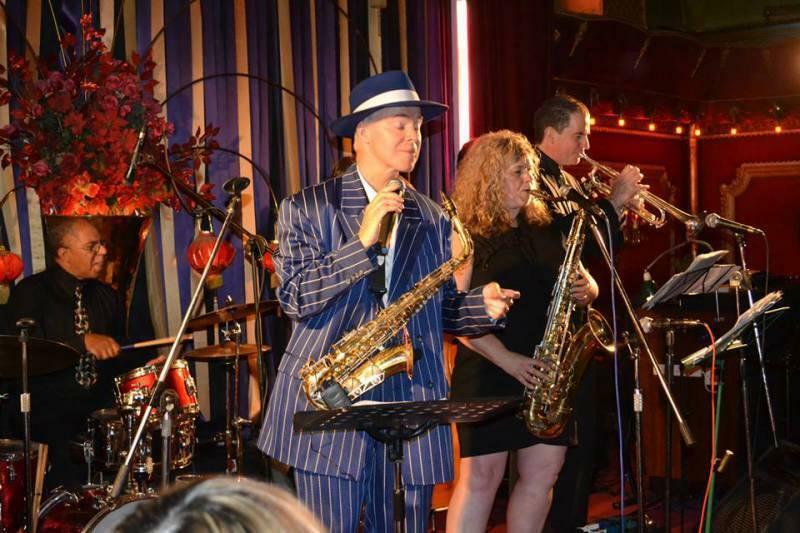 One Jump Ahead are a professional 7-piece band that will make any event go with a swing with evergreens from the Great American Songbook and more.